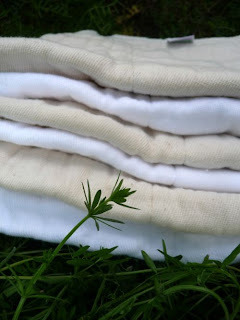 Prefold diapers are simple, easy to use and cost efficient. They're also great because there aren't too many choices that you have to make with them so if making decisions isn't your thing you should consider using cotton prefolds. One decision you will have to make in the prefold area, however, is whether you want to use bleached or unbleached prefolds. I've always wondered what the difference was between the two and there really isn't that much difference. Bleached Prefolds - Bleached prefolds go through a process before the threads are woven where they are removed of any color. Bleached prefolds are white which is appealing to the eye and some families prefer the clean white look. If tie dye or embellishing prefolds is your thing, then white prefolds work great for when you're feeling crafty! Unbleached Prefolds - These prefolds are cream or "natural" colored because they are in their natural state; they are also sometimes softer to the touch. Some families prefer unbleached because they like the natural look, want to avoid fabrics that have been treated with bleach or peroxide, and they like that natural colored prefolds can make staining seem less noticeable. We offer both bleached and unbleached prefolds here at Knickernappies. There will not be any absorbency difference between the two kinds of prefolds; the bleaching process is really more for cosmetic purposes. Find your local Knickernappies retailer to buy yours!